good price for a beginner, though from personal experience I always recommend using a classical to start out with as it is a bit easier on the fingers until they harden up. my lad just signed up at school for guitar lessons. Hes 7. Is this gonig to be too big? can you get smaller ones apart from Ukuleles? my lad just signed up at school for guitar lessons. Hes 7. Is this gonig … my lad just signed up at school for guitar lessons. Hes 7. Is this gonig to be too big? can you get smaller ones apart from Ukuleles? Yup. Thats going to be too big for a 7 year old. good price for a beginner, though from personal experience I always … good price for a beginner, though from personal experience I always recommend using a classical to start out with as it is a bit easier on the fingers until they harden up. I wouldn't. Completely different instrument and sound. Neck is wider at the top on a classical guitar, so there is some adjustment to make going from one instrument to the other. Just learn on what you intend to play and stick with it. i found out he needs a classical guitar, so will try and get one of those but in a smaller size. Surely this must be a godawful guitar at this price. Has anyone had any experience with Martin Smith guitars? Surely this must be a godawful guitar at this price. Has anyone had any … Surely this must be a godawful guitar at this price. Has anyone had any experience with Martin Smith guitars? 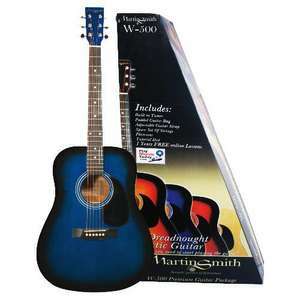 Not that I own one but Martin Smith guitars are usually fine. Sure, at this price its no gibson or takemine, but im sure it is fairly decent.